Becky pulled out her fiddle and handed it to me, and she sat at her old upright piano, ready to play. Believe it or not, I played fiddle tunes (not bad for a ‘cellist) while her fingers danced the keys. And that is how Becky Ashenden and I finished up our recent conversation. I thoroughly enjoyed my time at Vävstuga. More Swedish Classics gave me a chance to learn a few things I had been especially eager to try, like smålandsväv, jämtlandsdräll (you may know it as crackle), and pick-up band weaving with a backstrap and rigid heddle. It was wonderful to sit and have a chat with Becky at the end of the week to talk about various aspects of weaving. Click HERE to read the first part of our conversation. 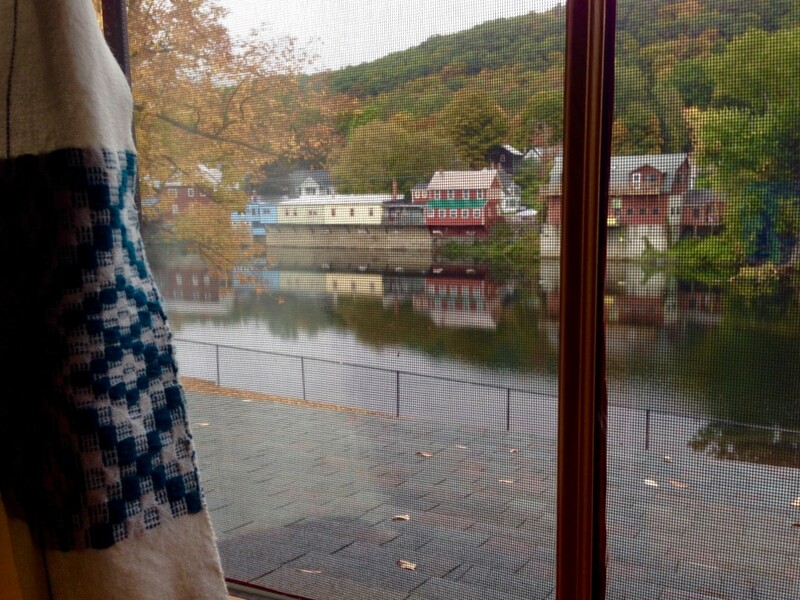 Handwoven curtains on windows in the Vävstuga student quarters frame the New England autumn view. 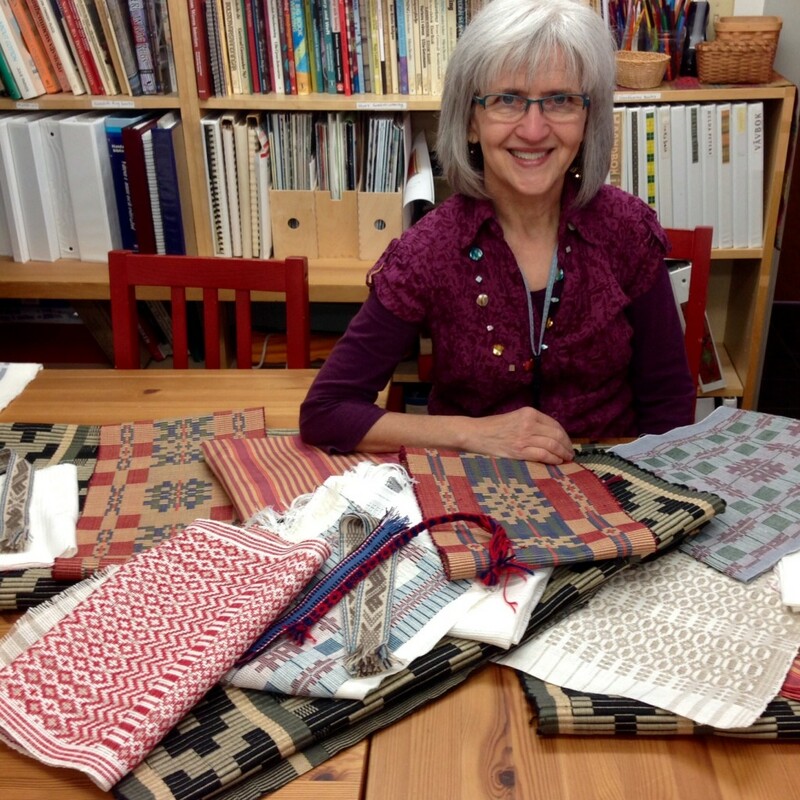 What part of the weaving process especially energizes you, Becky? Planning, measuring warps, dressing the loom, weaving, finishing? It might be a surprising answer. I really like threading; and I actually really like sleying. (Laughter) It is sort of mindless and repetitive. If the threading is not too complicated, I love the idea of listening to a book. I used to listen to a lot of recorded books while I was doing production weaving. I do enjoy the physical process of the weaving, too. I think my brain thrives on the repetitive process. If my hands are physically busy, it helps my brain focus. In what way does it help you focus? My mind loves to wander. I can conjure up new classes, or new ideas if I am busy with something repetitive like weaving. And with threading, it is a peaceful time, and I can think. If it is a complicated threading, I focus on the threading; but that is engaging in its own way. 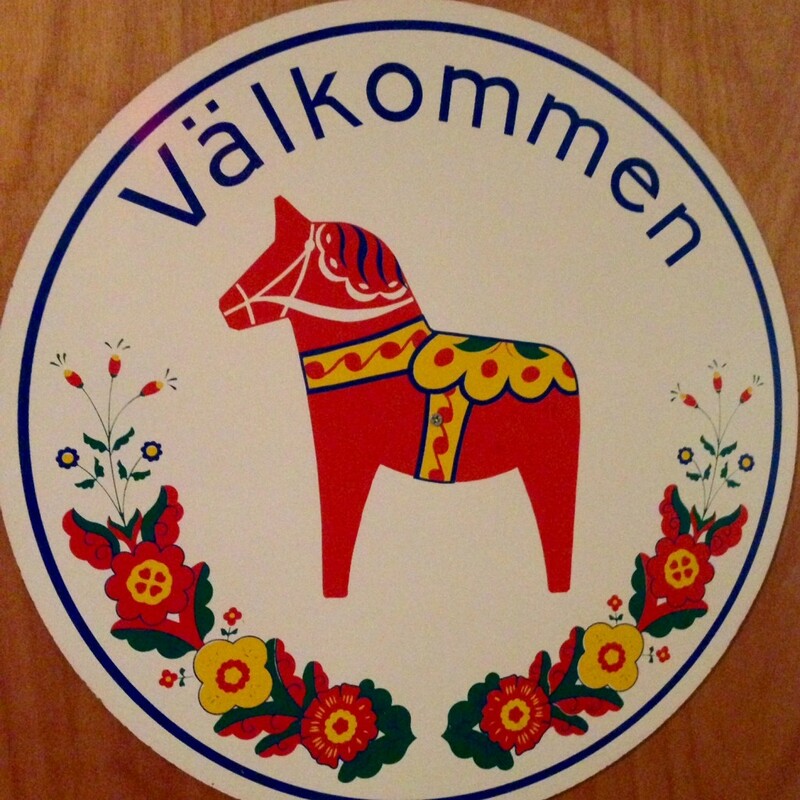 Cheerful greeting as you enter the Vävstuga weaving studio. Even if you do not know any Swedish, you can guess the meaning of this word. 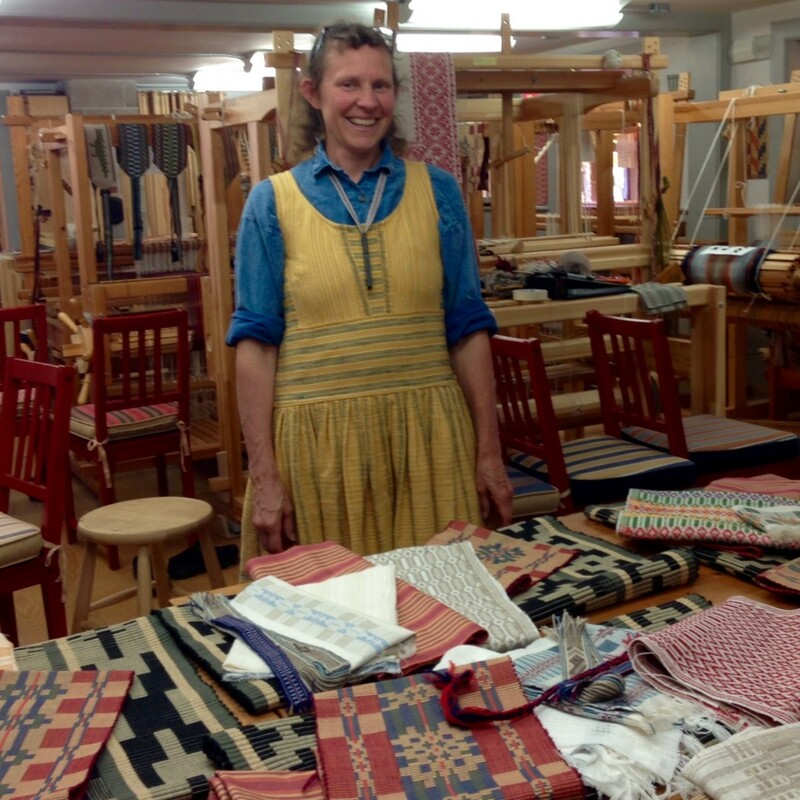 Speaking of classes and ideas… When I took Vävstuga Basics, some people in the class had been weaving for years. Why do you think people who already know how to weave come to your Basics class? They know how to weave one way, and they may have been taught by other people. But, they don’t know how to weave the way I teach to weave. The Basics class gives the opportunity to learn how I do it from start to finish. In other words, you teach things that they will only learn here? People tell me they want to know how I do things. They ask me, “How do you dress your loom? And how do you handle a shuttle, get good selvedges, fix broken threads, understand drafting, and keep good records?” Well, that is my Basics class, where I share a lifetime’s worth of knowledge. I was taught extremely well, the old-school way, in Sweden. I have also developed my own shortcuts that I share with students. How does it work to have students with various levels of experience in the same class? Might a beginner feel out of place? No matter who comes to my Basics class, I cater to who is there. For those who are advanced, I give them something beyond what they have experienced already. I always give as much of my knowledge and experience as students are interested in and can absorb. I also make the class work for a beginner. So, a beginner should not be intimidated at all. Even someone who has never put a warp on a loom, or someone who has not been successful doing it on their own? One thing that helps the beginner is simply that the warps are put on by everybody together. No one person is going to be left behind or put on the spot. The warps will go on; and, they will go on smoothly, because I oversee it. Students can partake in whatever amount of the process they can absorb. Gorgeous results from More Swedish Classics. Becky enjoys the students’ accomplishments. It must be interesting to see what a beginner can accomplish in just five days. Some people who come to Basics, who have not woven before, take to it like a fish to water. It makes sense to them, and they whip through everything. I have seen absolute beginners weave beautiful things. And they’ve never touched a loom before! It might be more challenging for people who are used to doing things a different way. But I say, “Try this.” “Try holding your shuttle this way,” or, “Try stepping on the treadle this way.” It might be a completely different loom for them. Does it matter what type of loom someone has at home? Does it make sense to come to Basics if they don’t have a loom like one of yours? A lot of people are used to jack looms. So, another reason to come to Basics is to experience the looms we have. Come and learn how to use them firsthand from someone who has had decades of experience using these looms. We have Glimåkra looms, both counterbalance and countermarch. There is a tie-up system that I developed for the countermarch which is unique. This is something that I teach in Basics. This method makes the countermarch tie-up very easy for the body. You spend as little time as possible under the loom. The sheds are accurate the first time. I can attest to that. Your tie-up system makes it a breeze for me to set up my countermarch loom at home. That simple tie-up system makes a huge difference. It opens up the world of being able to do multi-shaft weaves. These Scandinavian looms are old-style looms. Originally, this loom design came from China. It moved across Asia, and then through Europe over the centuries. Big old barn looms are basically the same thing. A big frame loom with a hanging beater. Does the hanging beater make a difference? What advantages do your students have by being able to weave on Swedish looms here? The hanging beater is something that makes the weaving happen, almost by itself. It takes the physical work load, the body wear and tear, off of the human being. So, if someone is curious about weaving in general, or Scandinavian looms in particular, this would be a good chance to try it out. This is the opportunity to explore weaving, and discover the possibilities. They can try it out on our looms, without the commitment of changing looms at home. And have fun while they’re doing it. It is the fun, the meeting other people, and the camaraderie, that makes it special. It is a whole social experience that is an absolute blast. Eating good food together… The social part of eating meals together, having a good time, laughing together, adds so much to the experience. Tablecloths and napkins this time. Handwoven, of course. 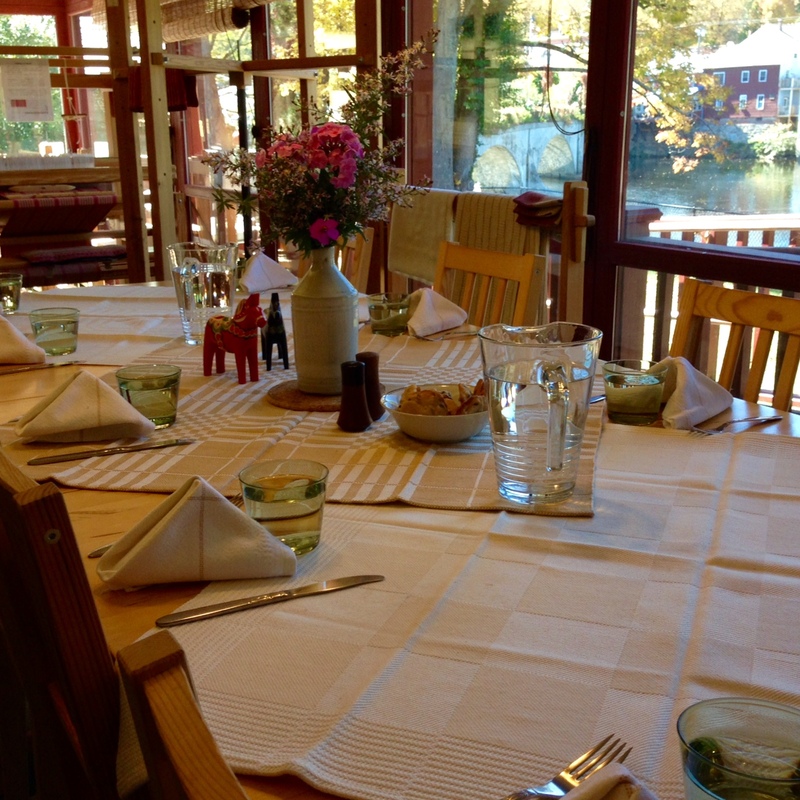 Table runners, placemats, napkins… It is always interesting to see how the table is dressed. I think the enjoyment around the table helps us relax, making our studying and weaving time that much more effective. People are not having other things to worry about. Your brain can focus and absorb as much as possible. What is your primary goal for Vävstuga Basics? The goal of Basics is to cover everything someone needs to know to be able to weave on their own. I want to give everybody the tools to do that. I love that I can take everything I learn here and do it all on my own at home. Or, I can just come here and have the pleasure of weaving in good company. Some people come because they are interested in learning the techniques that I teach, or to see if are they interested in this type of loom. And other people come to see if they are interested in weaving at all. They may want to learn how to do this; and then, they can come here and weave. Maybe they don’t have the space, or the money to buy the equipment, or to have a stock of yarns. But they can come here and weave. We welcome students who come for all these different reasons! Class is over for “More Swedish Classics.” It is fun to see everyone’s woven efforts across the table. Becky, thank you for sharing your thoughts. It is always interesting to hear what goes on behind the scenes at Vävstuga! I enjoyed it, Karen. It’s been my pleasure! May your experiences make you smile. Thank you for this in depth interview with Becky, a truly unique individual who is a blessing for all who make the effort to go beyond their comfort in meeting their personal creativity goals. Your interviews truly reflect her focus on teaching, which is entirely different than some classes that are “taught” by an expert who is not a “teacher”. Thank you for the feedback, Eileen. I’m pleased to hear that Becky’s valued teaching style comes through. That’s what I was hoping to portray. Great interview and beautiful pictures! I appreciate you stopping by and leaving such a kind comment!